Albania | my heart is happiest when i travel. read. write. connect. Brought in 35 with a BANG! So…my birthday was last week, and I celebrated on Saturday night with an epic theme party (oh how I love a good theme party)! My friend Keri and I planned one of the best parties I’ve ever had! The theme was Prom, and the plan was a scavenger hunt bar crawl. The best part was that we actually had a surprise prom set up at the last bar, complete with decorations, a photo booth, snacks, cake, and spiked punch. It all began with the invitation…including a picture of me at my Junior Prom (19 years ago!!!). Oh man, I had such a baby face back then! Next up was planning the scavenger hunt…this was definitely the most fun part of the planning process! We categorized the tasks into photos, videos, things to collect, and drinks to drink. The best part was that all photos and videos had to be uploaded to Instagram throughout the night with the hashtag #keslerprompubcrawl so we could follow the other groups and see what they were up to! We all met up at one bar, got into teams (we were Team Spice Girls), and began working our way through the scavenger hunt. Along the way, there were checkpoints where we would see our friends/competitors and trash talk one another. Some of my favorite tasks were singing “I’m a Little Teapot” (with motions) in front of a slew of people at a crowded bar, finding a stranger to play Rock, Paper, Scissors (we had to teach him first! ), and me convincing a stranger to let me try his food (it was good, by the way). Here are a few of my favorite pictures from the night…it was definitely hard to narrow it down to just a few! This entry was posted in Slice of Life and tagged #sol16, adventure, Albania, birthday, friends, living abroad, party, prom, prom party, pub crawl, pub crawl scavenger hunt, scavenger hunt, Slice of Life, theme party on May 24, 2016 by aggiekesler. Surrounded by PYP…and Loving It! Holding dual roles at school means that sometimes I wear one hat more than the other. Lately my PYP Coordinator hat has been on more often, as our Exhibition has been fast-approaching (it’s TOMORROW!). Last week and this week, I have been surrounded by PYP– literally. I can’t seem to get away from it, but I sorta love it! As I mentioned, our Exhibition presentations are tomorrow. Our Grade 5 students, teachers, and mentors have been working their little tails off getting ready for this momentous occasion for the past 6 weeks. Their collaborative, in-depth inquiry has lead them to some really interesting learning experiences and to take action in their local community. Here’s a video of their journey thus far. Today, I attended a field trip to our sister school, ACD, to attend their Exhibition, and then worked with the students on perfecting their presentations and display boards. I think know we are ready! In addition to the Exhibition, we held a PYP training for all staff this past Saturday and Sunday. Unfortunately I was sick and could not attend all of the training, but the teachers did some amazing thinking and reflection while I was gone! A documentary made about our school, and how we teach, was just released online today. It shows what it’s like attending and teaching at an international school in Albania, but also what it means to have an IB education. We are a candidate school for all 3 programmes of the IB- PYP, MYP, and DP! Lastly, today during recess, I was drawn to a group of girls who were playing in the field. I watched them a short while and noticed they were gathering items and piling them up. I decided to investigate. After approaching the group (one in preschool, one in Grade 1, and two in Grade 2), I asked them what they were doing. They explained they were building a nest for the birds. When I questioned them further, they explained that people are cutting down trees, so birds no longer have homes, therefore they built a nest for the birds. They included leaves, flowers, dried twigs, berries, and a long stick. The berries were for food, of course, and the stick was so the bird could locate the nest and have something to sit on. The interesting thing is that they are all learning about Sharing the Planet at this time, although their Central Ideas vary. This group of girls decided, on their own during their free time, to take action to help animals who are losing their homes. If that’s not PYP, I don’t know what is! It’s moments like this that remind me of why I do what I do and why I believe in it so much! 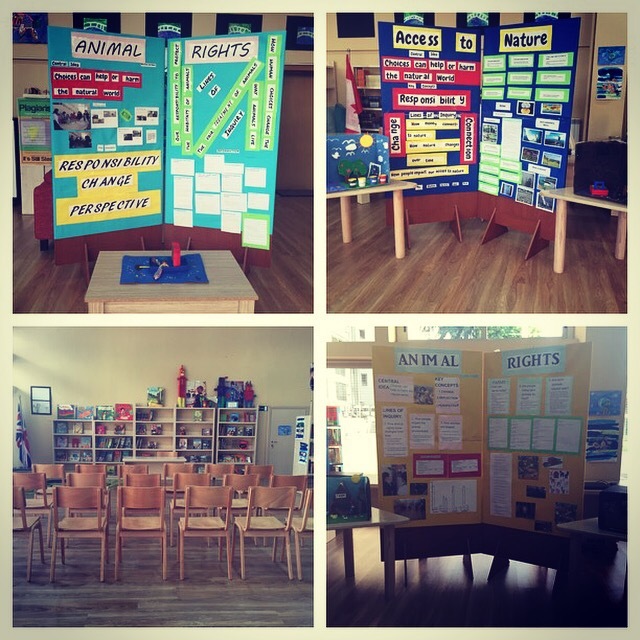 This entry was posted in Slice of Life and tagged #sol16, ACTirana, Albania, exhibition, pyp, Slice of Life, students on May 10, 2016 by aggiekesler.